D'EAT SHENGLY'S BAKED COOKIES 4: SLAM ME THAT SLIME SPHERE, BUDDY!! Our favourite fans have already recieved their thank-you packages in the mail. If you have NOT recieved any such, it's because you didn't pay us enough money! Sorry. Not!!! A: This is an FAQ!!! Geeze lousy eeze! Q: How do I complete the robot quest? A: Destroy their cottage, steal their wed-mug, smash their spaceships, drink their lukewarm space-booze, crush their leaders, spill their milk.=! Q: Why do you keep making these horrible games that nobody wants? A: I have reported your address to the super-police and they will have your house surrounded within minutes. Q: What is the plot of of of Return To Castle Desheng 3D? A: I'm glad you asked!!! A: In this 'spiritual successor', we have taken what people LOVE about the original (shotguns and demons) and taken them out entirely. Instead, what we have here is a tale of love. Love, and redemption. Love, and redemption, and cold-blooded creatures. STORY: Are you one of Zepulon The Raider OF Defenders of Space Zones, a stereo of the future, a princess warrior fated for great destinations, a fantastic pair of binoculars, WufflePuffer The Wonder Dog, bald space marine space-farerer, a giant key stuck on something, or ???! STORY: IF SO, you are already a part of this fantastic game!! EVENT: Zepulon laid down after being shot. EVENT: stereo had nobody to play it... yet? EVENT5 Bald Space Marine got back his keycards! EVENTS:Giant Key is still stuck in the muck- or "muck stuck"! STORY: Any reader who is now left thunderstruck at these turns of events will have no difficulty in catching up: included in this package is the zeroth entry in the series, at no 'added' cost!!! Story: Breaking Story: STORIES OF MANY BUILDINGS CONTAIN NO 13TH FLOOR, THEY ARE RESERVED FOR "MILITECH RESEARCH"
Q: How much of this is STOLEN? A: Very little... I used many of the 'libraries' provided by clickteam, various freely-distributed packs of samples, as well as some sprites from Fist of the North Carp! Q: How much of this is YOURS? A: Very little... The guitar playing in the "Dig" AKA "Wow Another Item..." Zone, past the noisy intro section, is all by me, Ruffty M¢buck$! The music on "And/OrAdventure" is also by me, an edit of the first take of a song idea by me. Look forward to the smash hit "Music From The Bride Of The Gator" coming soon!! Q: This format for jokes is getting old and tiresome. A: Did you know: You can HOLD DOWN some of the buttons on the stereo? Well, you can do that. Try it now. C'mon. It's cool. Seriously. Not all of the buttons though. Just some of them. Ok well like half of them really. A lot of the buttons just reverse the 'direction' so if you only look at the actual features, it's probably exactly half. Q: Where can I send in my mail-in rebate for Dolphin Watch Deluxe Edition? A: Sorry, our mail service no longer exists, so you can not. Q: Who is Macmillian? And were they the real culprit? A: Have you tried, oh I don't know, holding down a combination of two non-contradictory arrow keys like the INSTRUCTIONS tell you to? A: Sorry, I don't have any 'lemonade' with me so I can not read this invisible text! Q: Why does this game have such deep moral ponderings and questions? A: Our writers are well paid as well as fed! Q: UGH! This "action" (if you can say it has that!) "puzzler" (if you can say it is puzzling!) has me confounded! A: They are not a person, they are a thing: a large pack of samples gifted to me by one "shengly!" Also, no they can not be a culprit because; see first part of this answer. Stand atop your tower and launch boulders at the approaching soldiers. Idea started while playing Ziggurat. 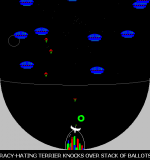 Protect Earth from incoming asteroids! See how many of the ten asteroids you can shoot down with your plasma cannons! Art by Kiki Snell.